It's been awhile since the last major TouchDRO version release and I'm getting an increasing number of emails asking if I'm still developing the app. The answer is "definitely yes", and the new version is getting very close to be ready for beta testing. It has a number of new features and countless quality-of-life changes. I've been testing it in my shop for some time now and most of the functionality is pretty stable so it's a good time to post a quick preview of some of those changes and new features. One of the benefits of TouchDRO over an old-fashioned DRO unit is the superior user interface. For the next version I had a chance to get help from a professional UI/UX engineer (who specializes in designing dashboards for jet planes). Based on her input and your feedback I've made a number of changes that will make TouchDRO even more intuitive and easy to use. Side note: To get access to beta version (once it's available), please join TouchDRO Beta Users Google+ community and opt into the beta program; for updates and feature highlights follow TouchDRO on Facebook. The main DRO screen has undergone some major changes in order to make it more efficient. 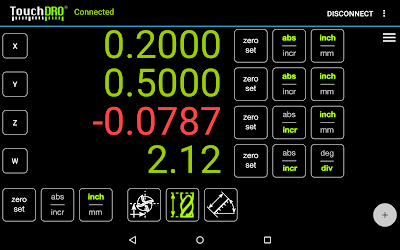 For example, the sidebar that contains saved coordinates can now be collapsed out of the way, exposing additional "inch/mm" and "abs/incr" buttons for each linear axis. When working with saved coordinates the panel can be expanded, in which case only the "zero set" button will be visible next to each axis. In the screenshot above you might also notice that the axis label has been replaced with a button. 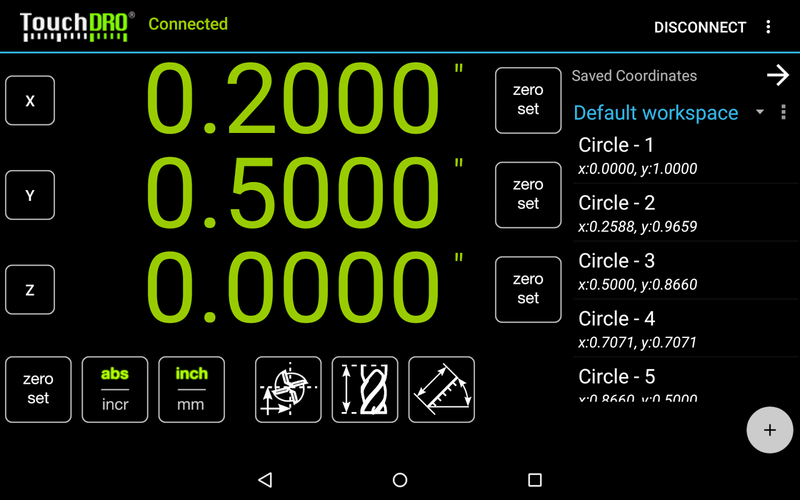 Clicking it brings up the "Axis Details" dialog; clicking the axis readout now brings up the "Set Dimension" dialog. 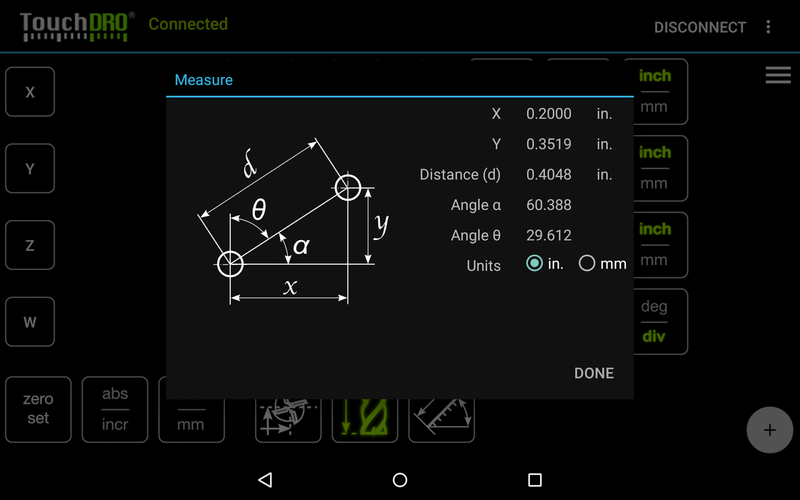 The latter has been streamlined as well: it will set the dimension based on the current axis mode. I.e. absolute dimension if the axis is in absolute mode and incremental dimension otherwise. The "Add Point" button has been replaced with the "Plus" button in the lower-right corner. By default, pressing the button brings up the "Add Item" dialog; long-pressing the button adds current coordinate. There is a setting to flip this behavior. Additionally, there is a setting that lets the "Add Point" function ignore the Z axis (so points use only X and Y axes) by default. Many of the buttons have undergone more subtle changes. 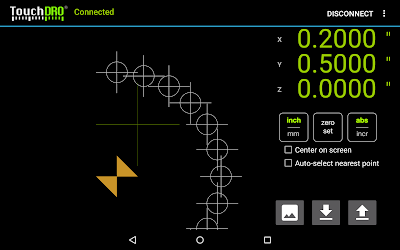 Most notably [Mill] "Tool Offset" function has been split into two: "Radius Compensation" and "Z Offset". In the current version of the app offset was cleared by long-pressing the button, which confused some people. 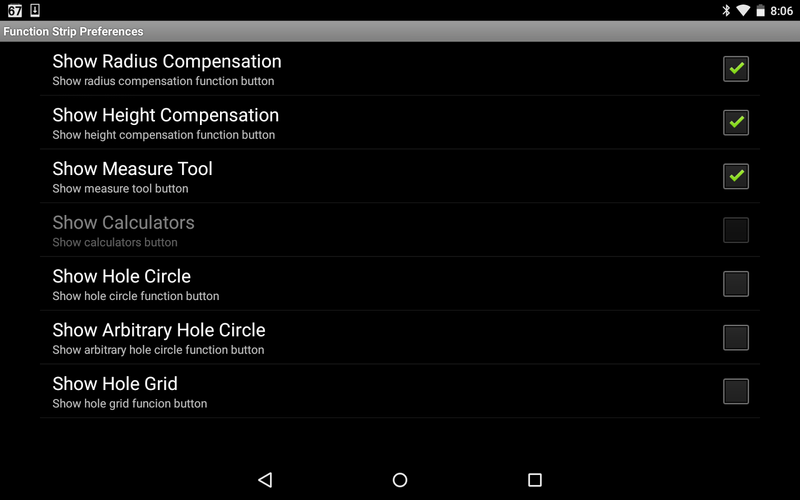 In the new version the buttons are "lit" when the compensation is active and when pressed clear the offset(s) (after displaying a confirmation dialog). 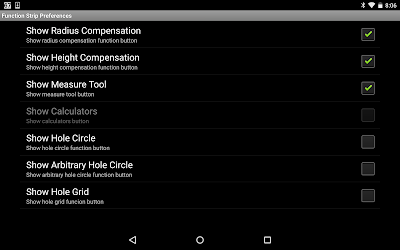 Finally, which buttons appear in the function strip is now configurable, so you will be able to show only the functions that are useful for your particular workflow. Angular axis is getting an exciting new feature: gear cutting function. It makes cutting gear using a rotary table with installed encoder a breeze: the "Gear" function let's you enter the desired number of teeth/divisions and the DRO will display divisions rather than degrees. To locate the next tooth simply advance the table to the next whole number. 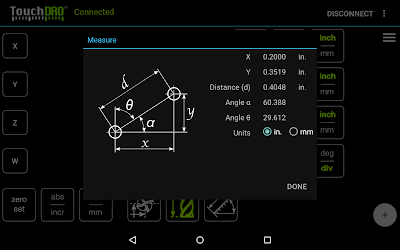 There is a new "Measure" function that displays the distance and the angle between (0,0) and the current position. 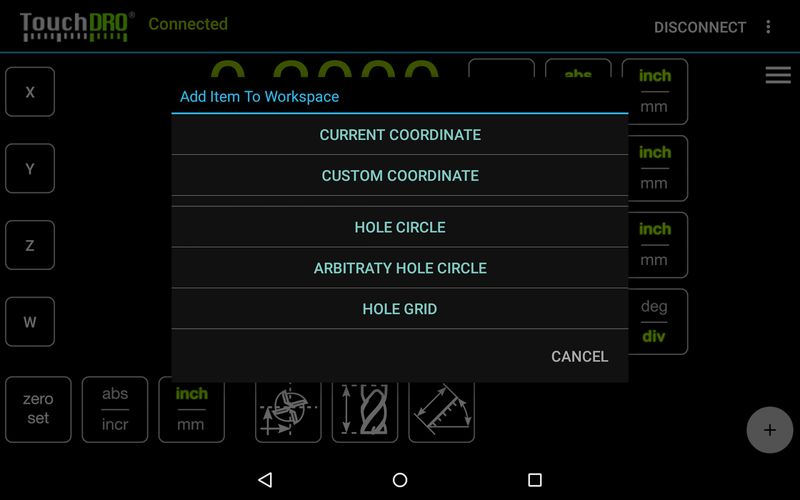 It can come useful when setting a part at an angle, etc. When the machine type us set lathe, the tachometer display can be toggled between RPM and Surface Feet per Minute (or Meters per Minute in metric mode). The Layout View (AKA Workspace Preview) is getting some quality-of-life changes and a few new features. 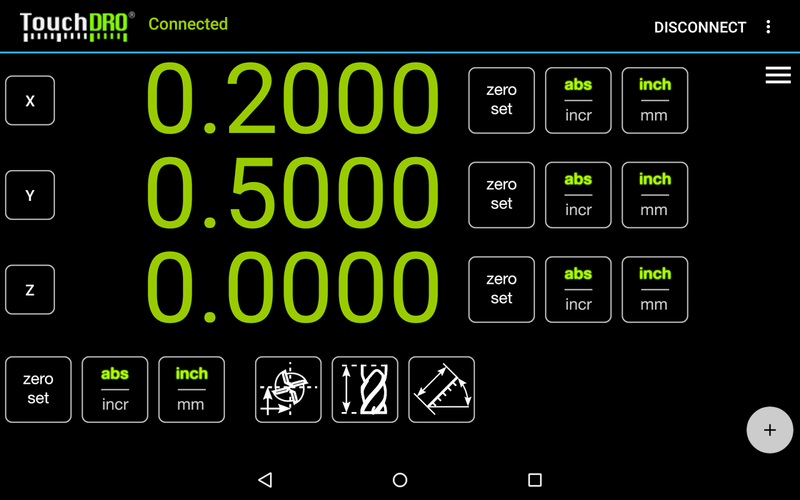 For instance, points and cursor sizes will stay constant regardless of the zoom level. Additionally, the rendering has been redone to be more efficient (less processor-intensive) and produce a more readable image. There are a few more significant features coming to the layout view, but I will cover them in a separate post, so stay tuned. 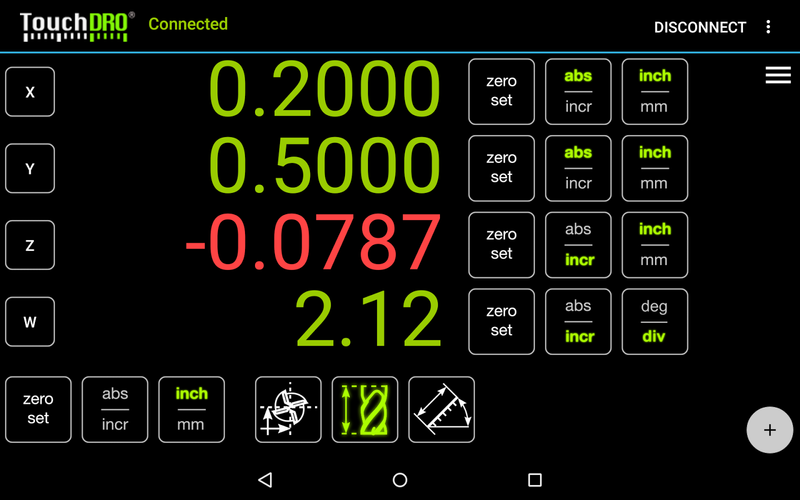 The new version of TouchDRO will have a number of new features and improvements. The user interface has undergone a sizable overhaul to make the DRO more efficient and easy to use. Besides the changes described above there are countless smaller tweaks, as well as a few new major features for the layout view. As the app gets closer to beta testing I will start posting more regular updates to the TouchDRO Beta Users community and TouchDRO Facebook page. As always, your feedback is greatly appreciated, so please feel free to post it here, on Google+ or Facebook. You don't mention probe support? Could I suggest that at the very minimum that you mimic the probe LED on the screen? It would then allow the controller to be mounted in positions where its probe LED is not visible. Looking good. Consider adding a small rate (ipm) field, especially on X for the mills with powered X feed. Any thoughts on when it gets released into the wild? Creative Commons Attribution-NonCommercial-ShareAlike 4.0 International License .